Ruud RAWL, Split System Air Conditioning units feature earth-friendly R-410A refrigerant. The Ruud Commercial Series Split System Air Conditioners combine money-saving efficiency, whisper-quiet operation, environmental-friendliness and superb reliability to bring you peace of mind – year after year. 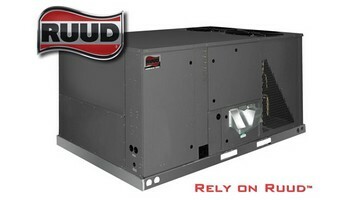 Nothing performs more reliably than a Ruud Split System Air Conditioner. It’s that simple. This platform provides you with a full line of capacities that are each AHRI-certified. The design is certified by CSA International. All of our residential/commercial package units, regardless of efficiency level, feature the Scroll Compressor. These scroll compressors use a more advanced technology than traditional reciprocating compressors. There is a separate compressor compartment for easy service access. External wraparound Crankcase heater helps prevent refrigerant migration to the compressor oil during long off periods. They have fewer moving parts; they are quieter, more efficient, longer lasting. All models feature Scroll® compressors for maximum efficiency and quiet operation. The 5-Ton RACA15 model features Scroll UltraTech™ 2-Stage compressors with Comfort Alert™ diagnostics (see below), high/low pressure switches, and hard start kit.Louvered condenser compartment to protect the coil against yard hazards and/or weather extremes.One-piece top with a drip lip to help keep water off of the unit sides.Drawn supply and return air openings feature a one-inch tall flange to prevent water migration into the ductwork.Access panels have “weep holes” and channels to further help manage water run-off.Side and down discharge options available on all models.Easily accessible blower section complete with slide-out blower.Externally mounted refrigerant connections are conveniently located for easy service diagnostics.Micro Channel evaporator and condenser delivers superior performance with less refrigerant charge and less weight than conventional copper tube/aluminum fin coils. In addition the all aluminum construction has superior protection against formicary corrosion and aluminum tube rubbing potential. Its easier to clean and has a more robust surface. Supplemental electric heat strips up to 15 kW are available (field or factory installed) for periods of extreme cold temperatures. Single point wiring simplifies installation.All units feature an internal trap on the condensate line eliminating the need for installing an on-site external trap.Easily accessible control box.Thermal expansion valve standard on all models for superior superheat control, reliability, and energy efficiency at all operating conditions.Solid core liquid line. Filter drier standard on all models (not shown).Rugged baserail included for improved installation and handling.Molded compressor plug.Complete factory charged, wired and run tested.A double sloped evaporator coil drain pan assures all water is removed from the unit to improve indoor air quality. One of the world's leading manufacturers of central heating and cooling products, Ruud distributes its full line of residential and commercial products around the globe. When purchasing a new air conditioning system, there are many factors to consider. To help with your decision, choose from one of the following categories: In business, reliable, cost-efficient cooling is not an option. It’s an absolute necessity. Whether you’re looking to keep a workforce cool and productive, or need to ensure optimal conditions for heat-sensitive material, Ruud commercial air conditioners get the job done. We offer a full range of state-of-the-art, high-efficiency cooling options – up to 25 tons. And many feature Scroll Compressors – the most advanced, most reliable compressors in the industry.